After I posted my finished Clara Dress, Danica from the Sew Liberated pattern company offered me a free pattern in return for a link to my post after I finish it. Who could resist such a lovely offer? I originally bought the preppy stripe and white fabrics to make a traditional shirt. The Schoolhouse Tunic has an empire line (a seam just below the bust), a placket that turns to the wrong side and is top-stitched down, and three-quarter-length sleeves. It is designed to be worn over a camisole. My plan is to turn that placket to the outside and make it white. I also want to add simple white cuffs (bands, really) to the end of the sleeves. I’m not sure how I will run the stripes. I may make them horizontal on the upper bodice and vertical on the lower bodice. 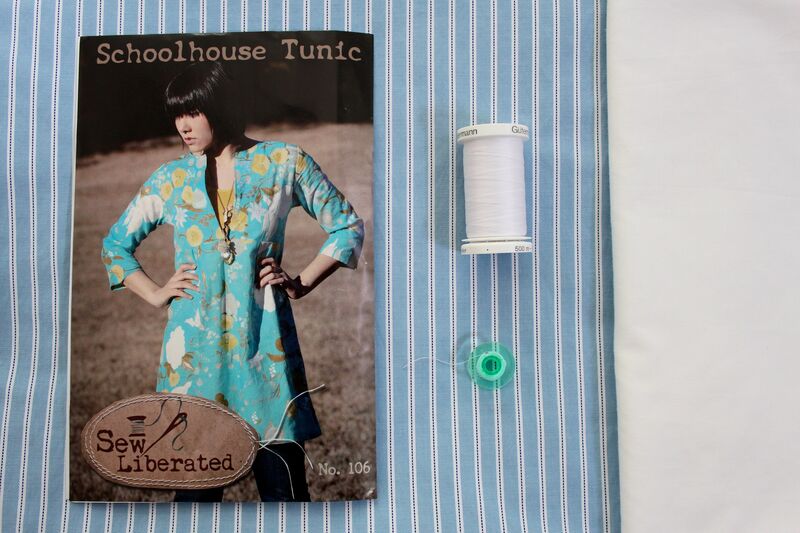 The Schoolhouse Tunic presents an interesting fitting and design challenge. While tunics are generally a flattering look on me, the combination of an empire line and the need for a full-bust adjustment could very well result in a garment that looks like a maternity top. I am counting on a good fitting job to prevent that. If it all comes together like I hope, it should be a nice layering piece. I lived your version of the Clara dress can’t wait to see what you do with this one! Thank you! I’m hoping it comes out well. Yes, you may use brown sugar — I have! I really like the direction you’re taking this pattern in. The crisp, lovely striped fabric makes me think of something a mid-century art teacher or artist in their studio might very well have been spotted sporting. Happy sewing, dear Jeanne Marie! You have the vision! Unfortunately, as you’ll see in my next post, it didn’t quite work out. I love this pattern but after making it realize I must do a FBA to make it work for me. Do you have a tutorial for this or one you can recommend? After searching the internet I’m at a loss as how to approach this problem. I had the same issue but I couldn’t resolve it either! I had to abandon the pattern at the muslin stage.